This is the most important recreational PADI certification. 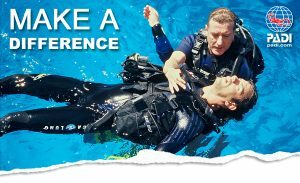 Becoming a Rescue Diver will give you the knowledge and practical experience to cope with emergency situations both above and below the water. Have you ever wondered how you would deal with your buddy if he was injured or panicked? With real rescue scenarios to deal with, you’ll learn and get to practice your skills as a competent diver. Having qualified as a PADI Rescue Diver, you’ll be able to recognize risk before it becomes a problem. You’ll feel far more confident in the water and most important of all, you’re now a real contribution to the safety and security of all who dive with you.